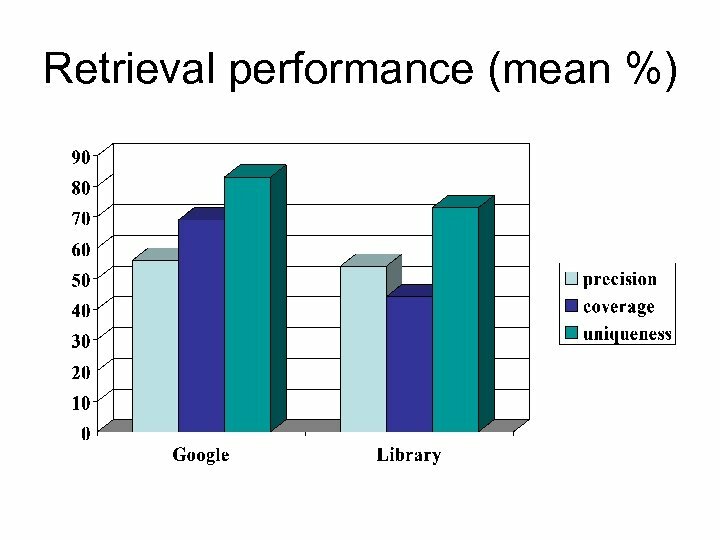 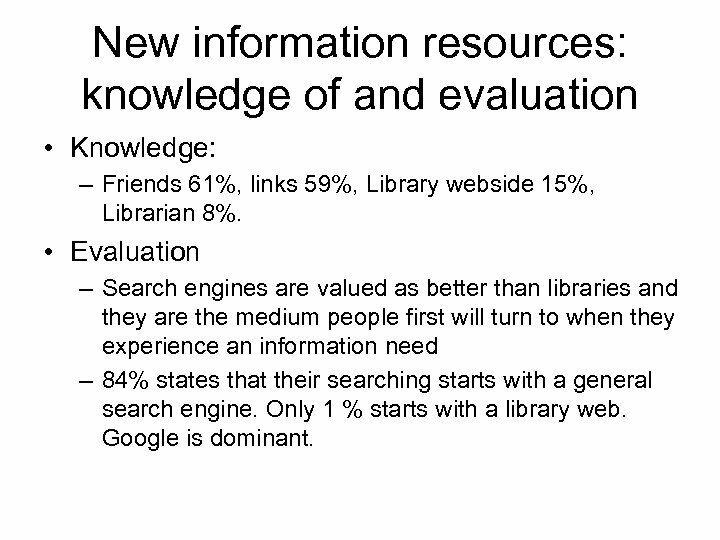 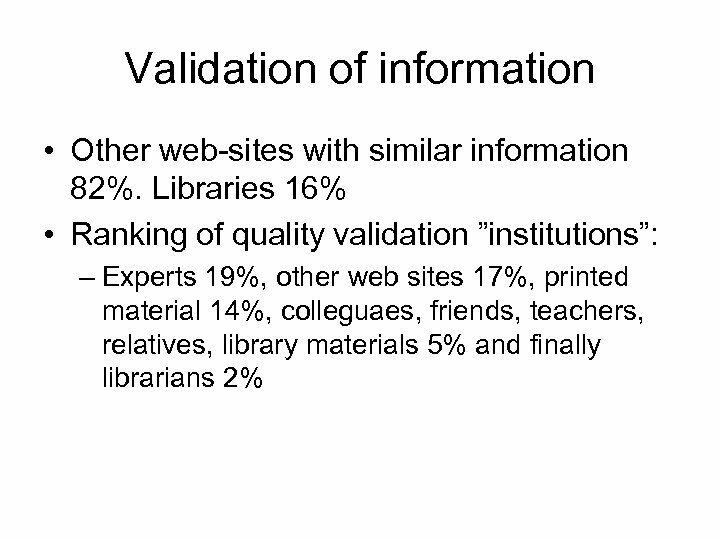 New information resources: knowledge of and evaluation • Knowledge: – Friends 61%, links 59%, Library webside 15%, Librarian 8%. 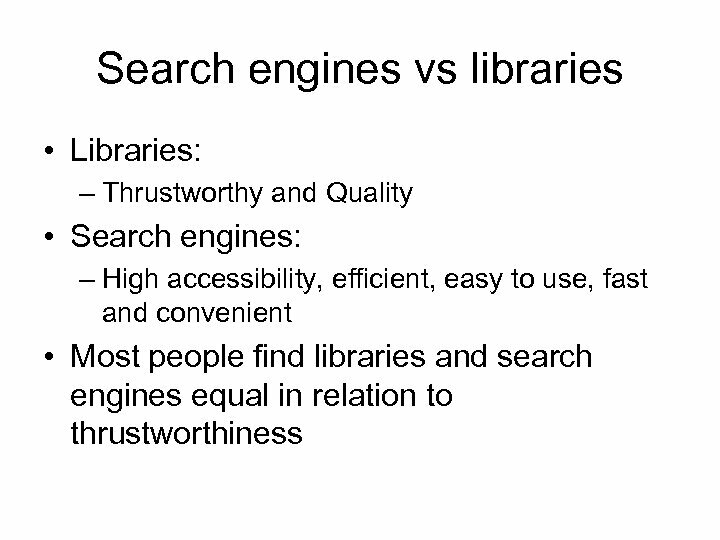 • Evaluation – Search engines are valued as better than libraries and they are the medium people first will turn to when they experience an information need – 84% states that their searching starts with a general search engine. 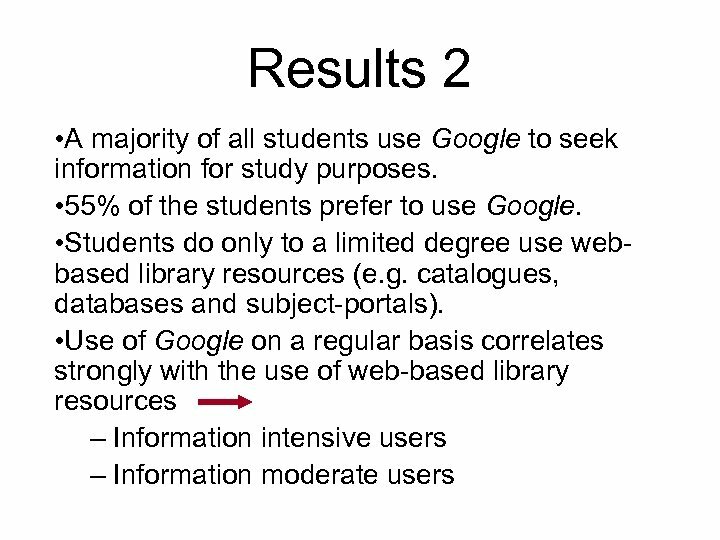 Only 1 % starts with a library web. 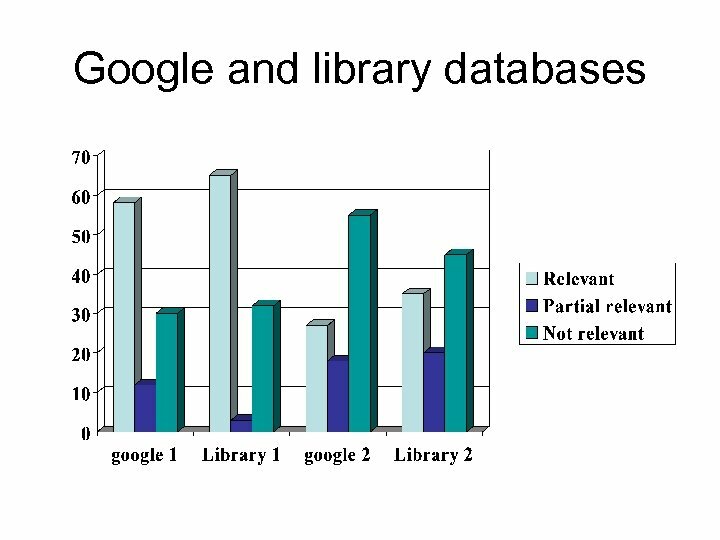 Google is dominant. 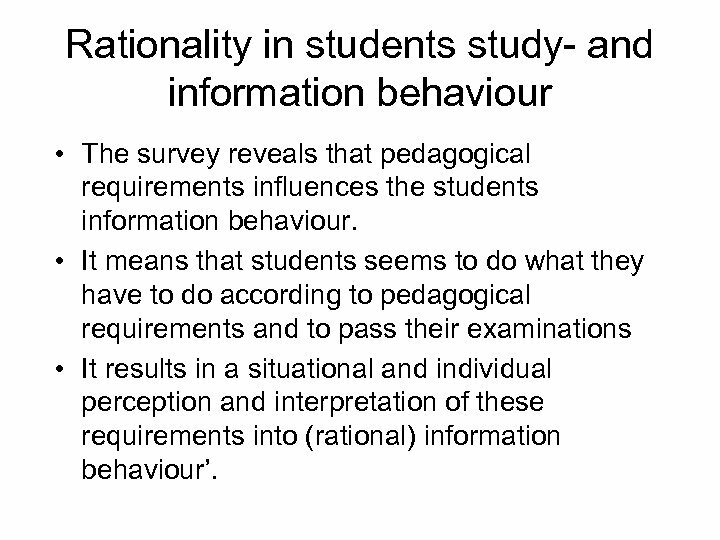 Rationality in students study- and information behaviour • The survey reveals that pedagogical requirements influences the students information behaviour. 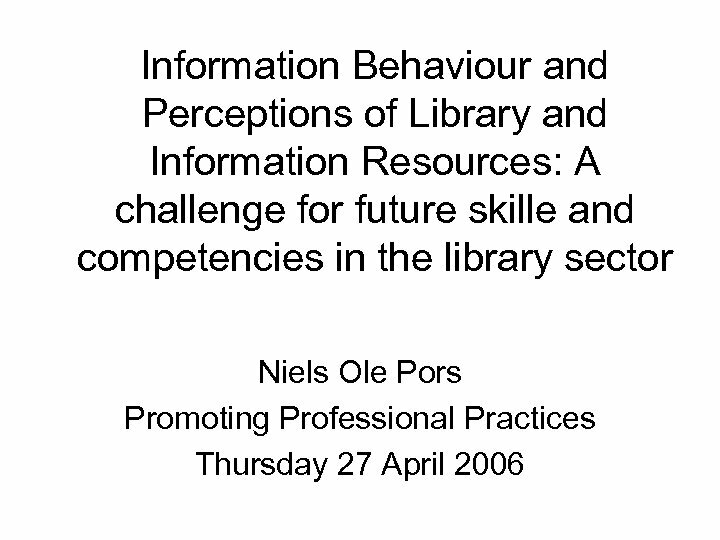 • It means that students seems to do what they have to do according to pedagogical requirements and to pass their examinations • It results in a situational and individual perception and interpretation of these requirements into (rational) information behaviour’. 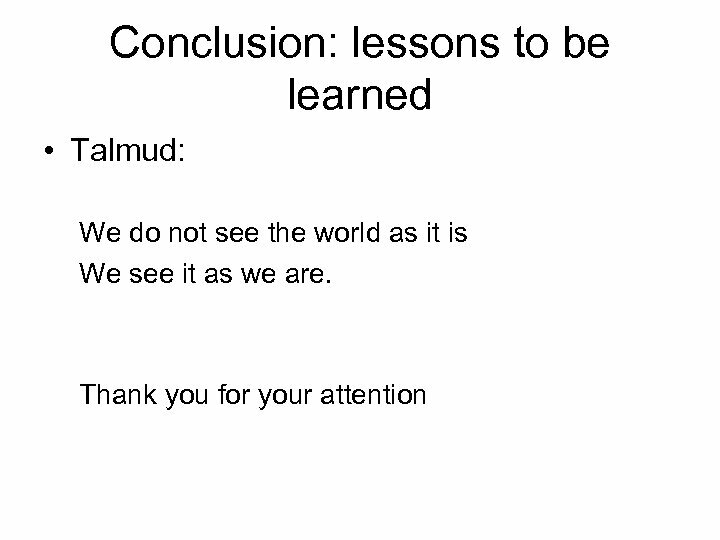 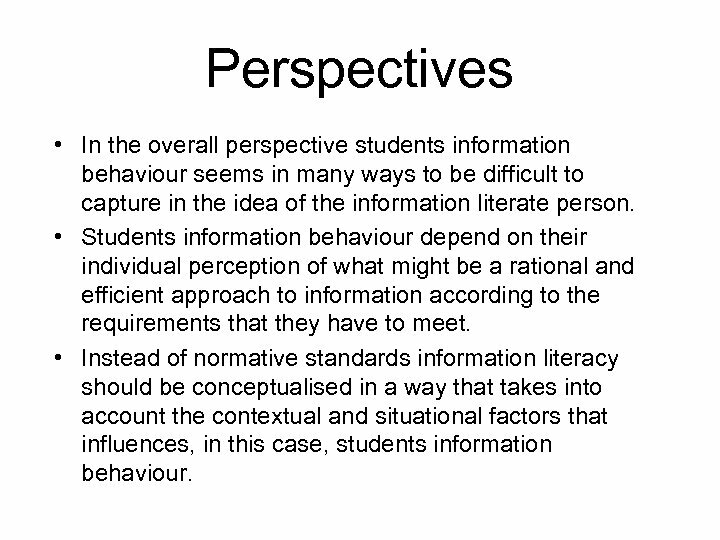 Perspectives • In the overall perspective students information behaviour seems in many ways to be difficult to capture in the idea of the information literate person. 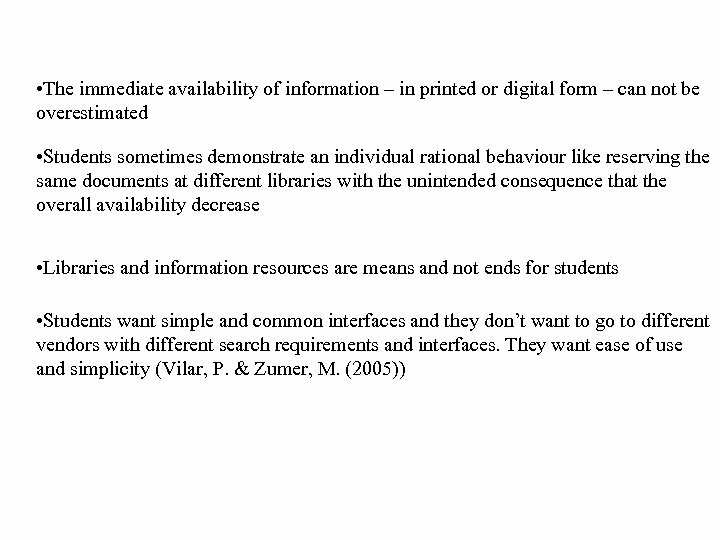 • Students information behaviour depend on their individual perception of what might be a rational and efficient approach to information according to the requirements that they have to meet. 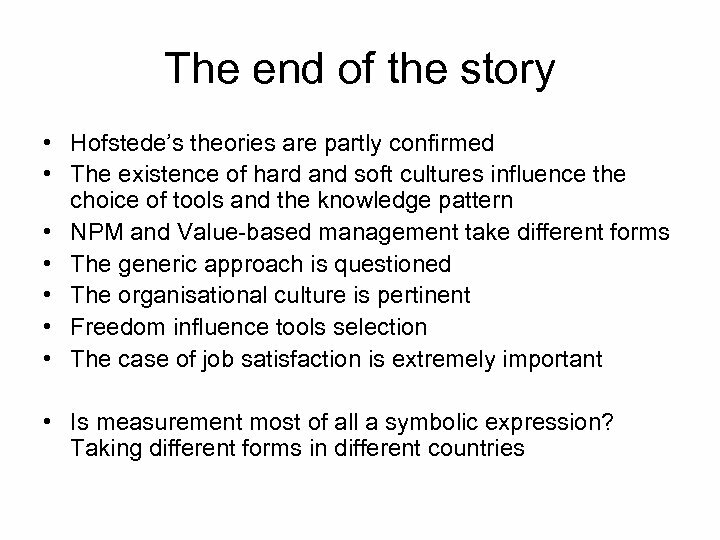 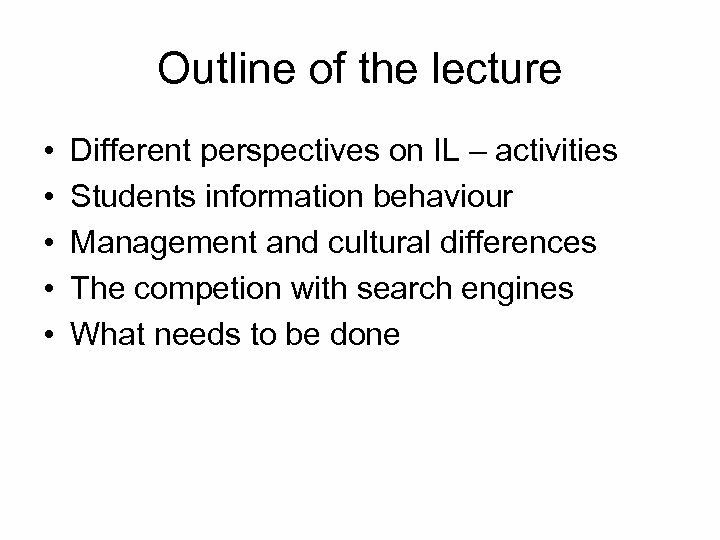 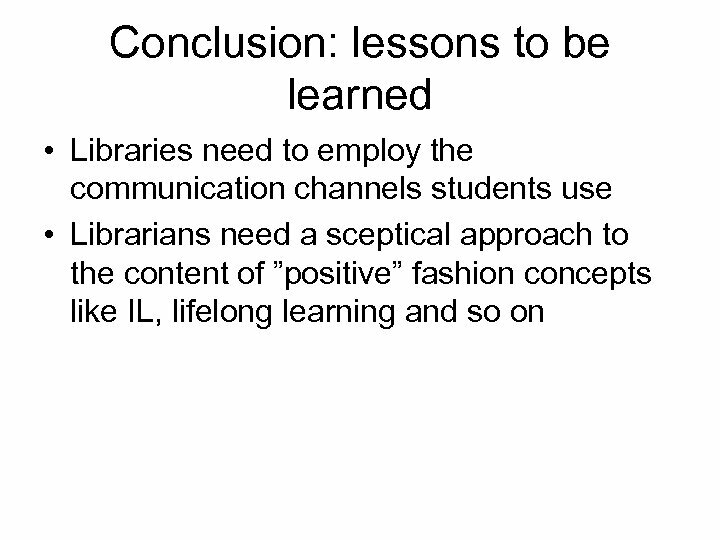 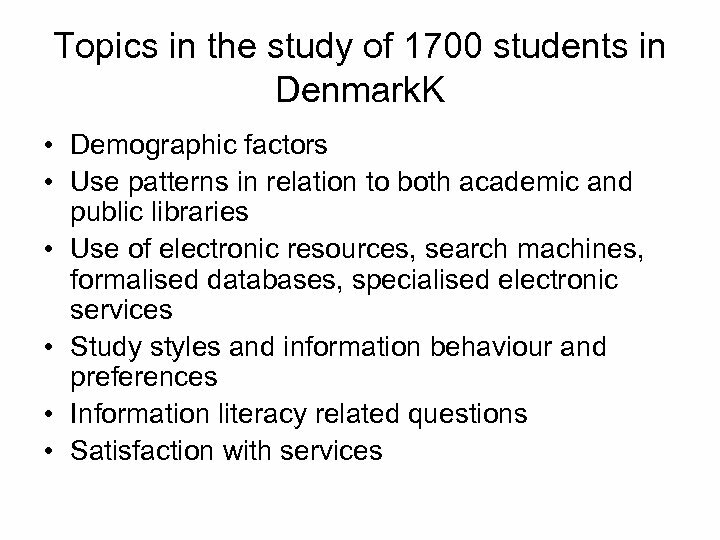 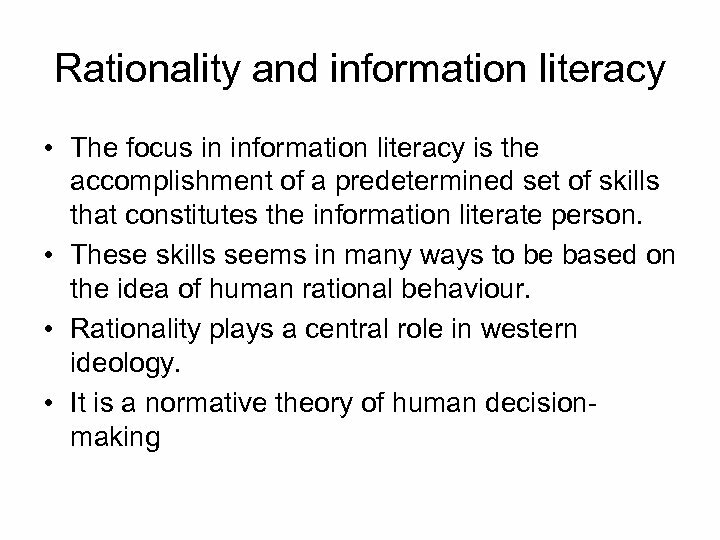 • Instead of normative standards information literacy should be conceptualised in a way that takes into account the contextual and situational factors that influences, in this case, students information behaviour. 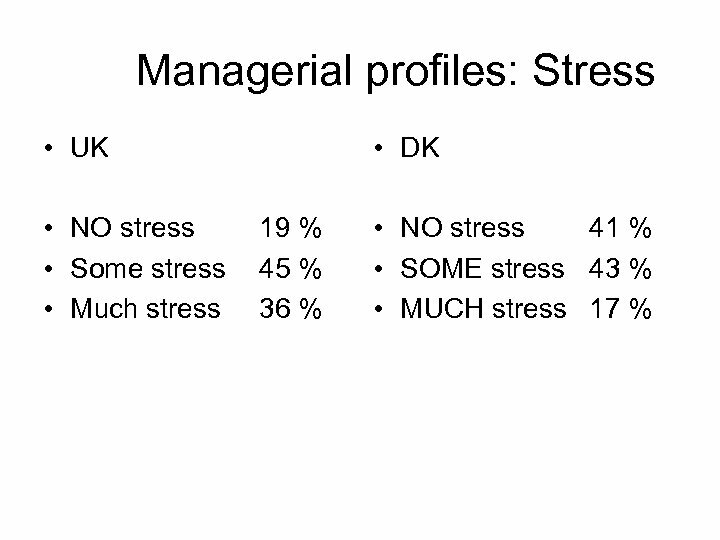 Results 1 • Overall the survey confirmed previous research results. 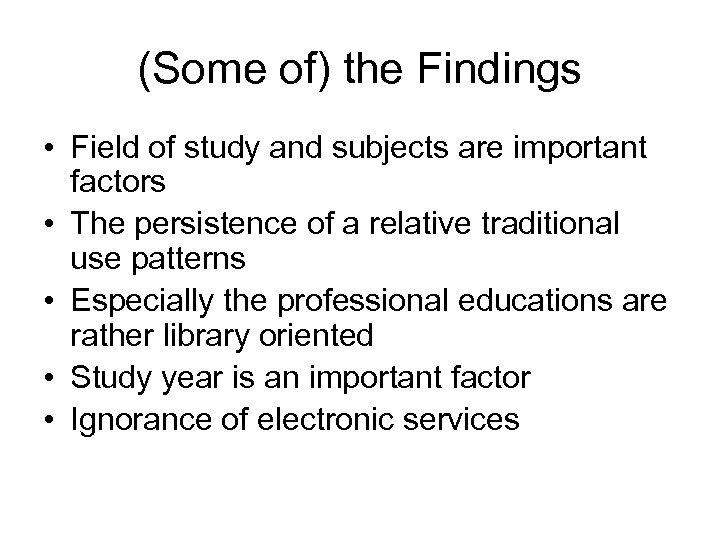 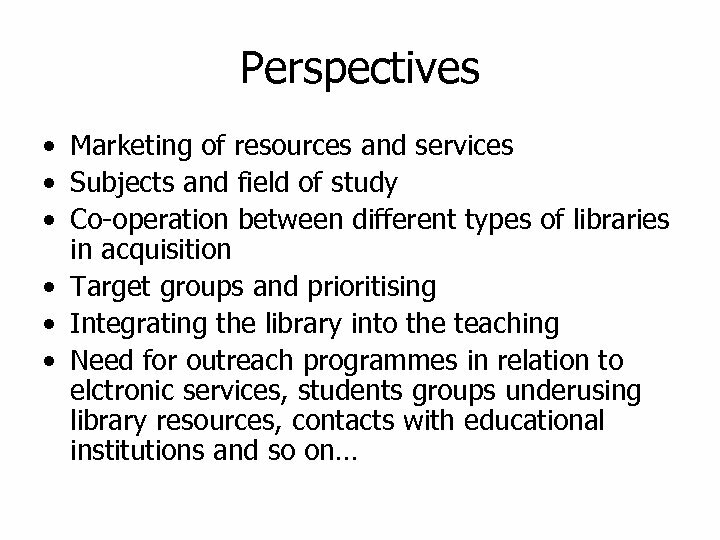 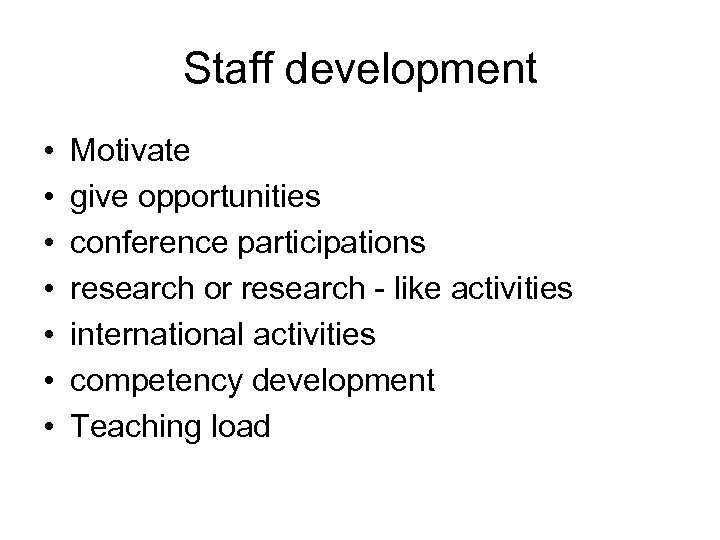 • Subject and study year plays a significant role in students use of both academic and public libraries. 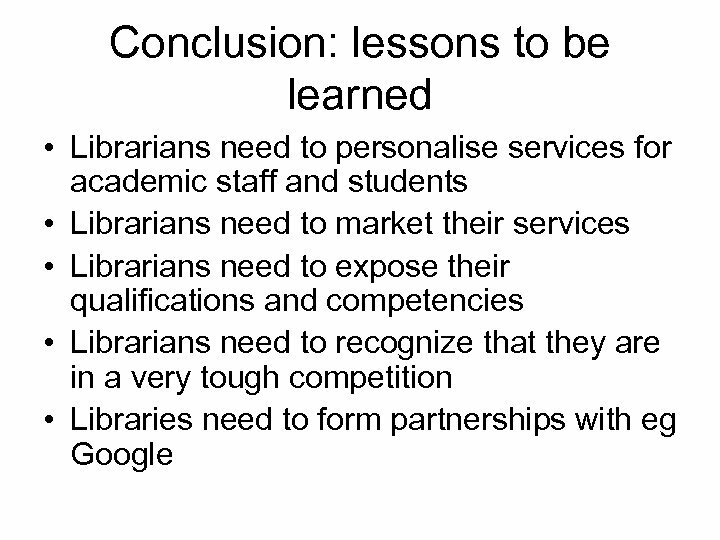 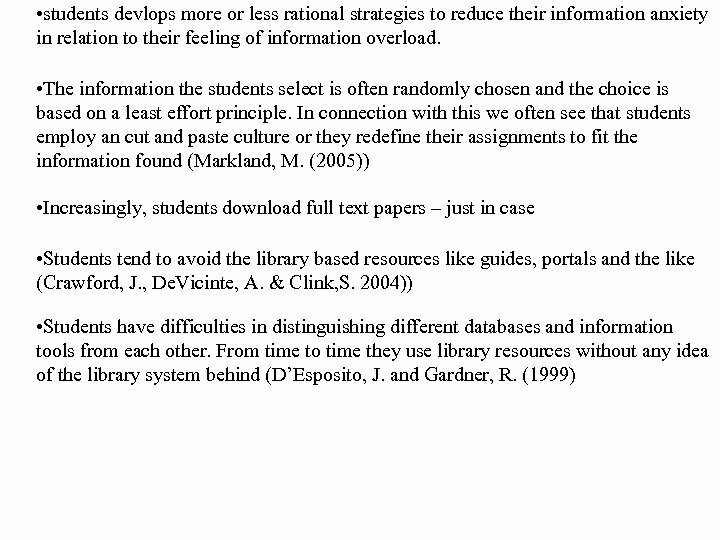 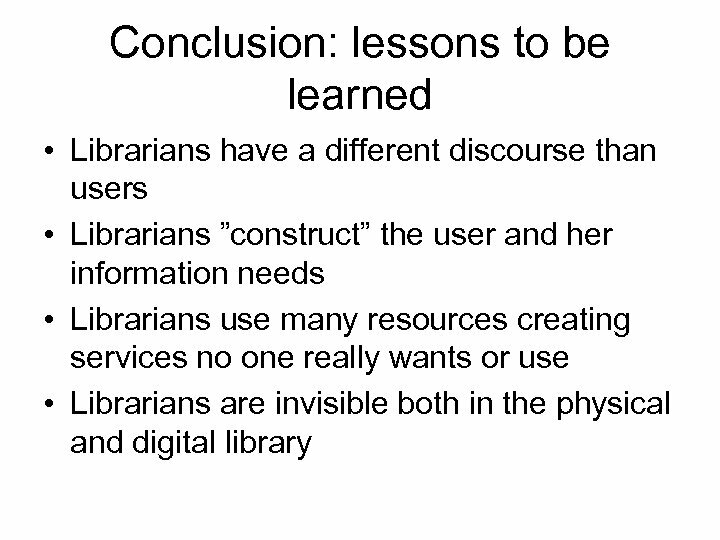 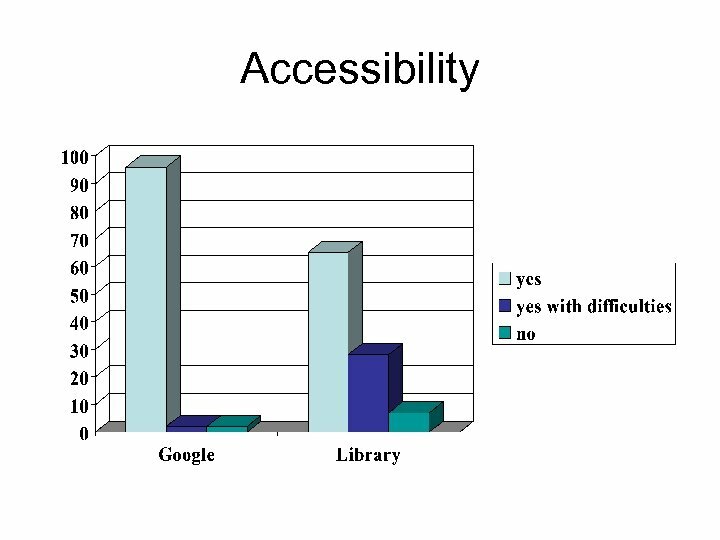 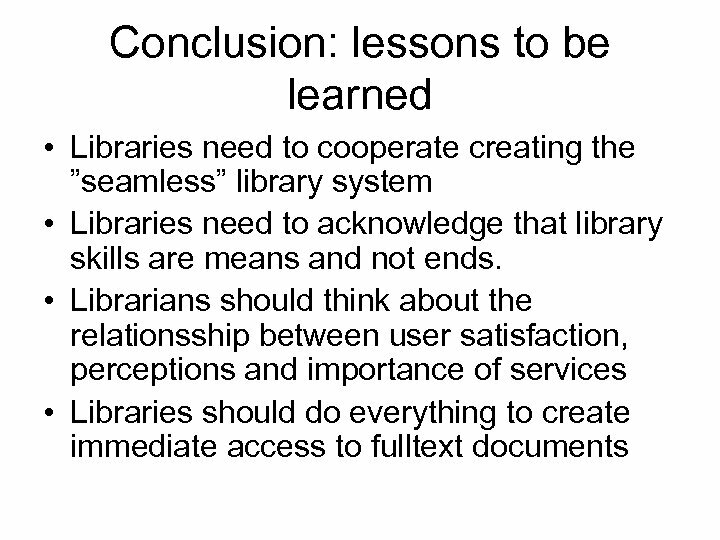 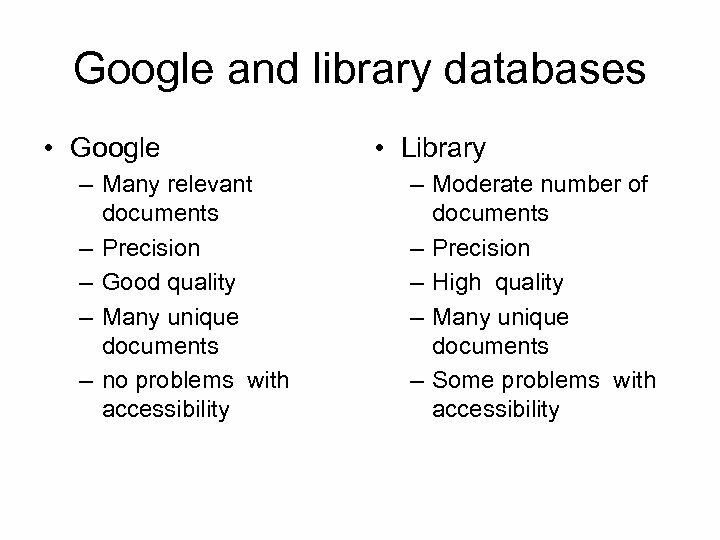 • 10% does not use libraries at all. 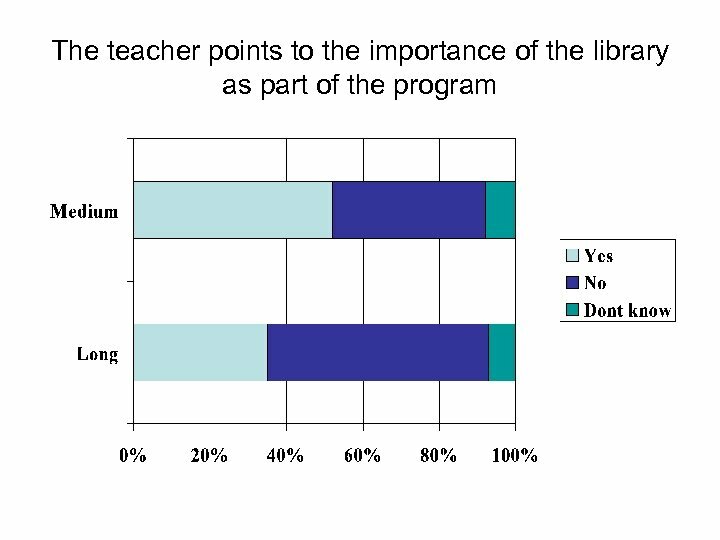 • The physical library is very popular among the students. 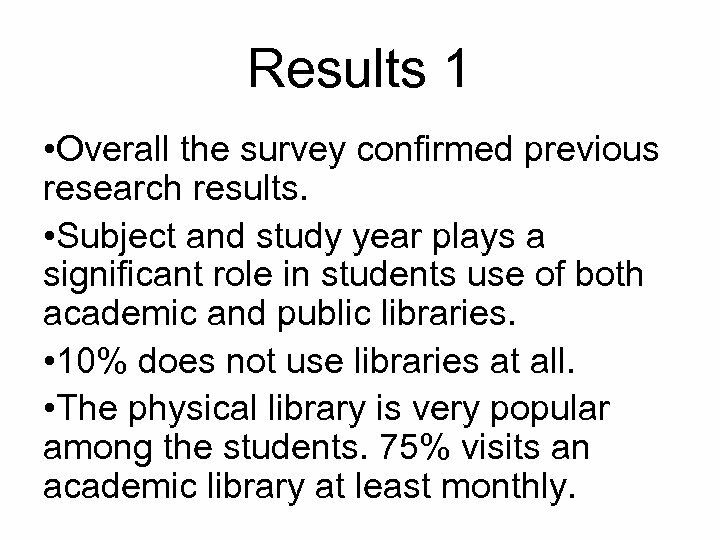 75% visits an academic library at least monthly. 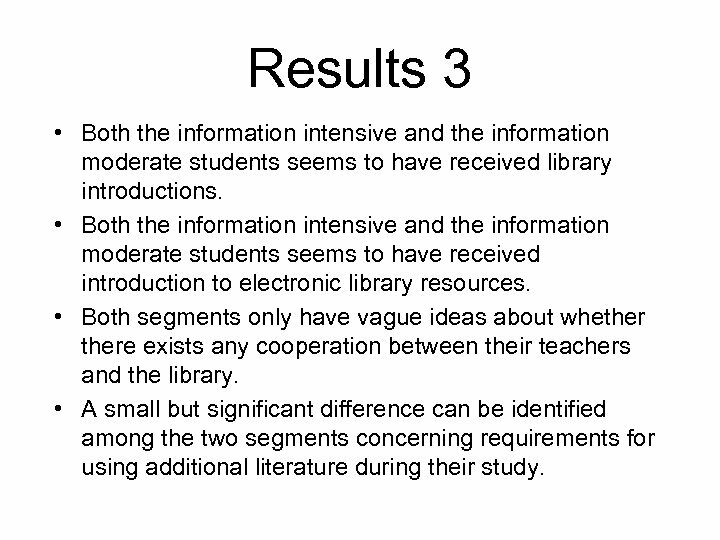 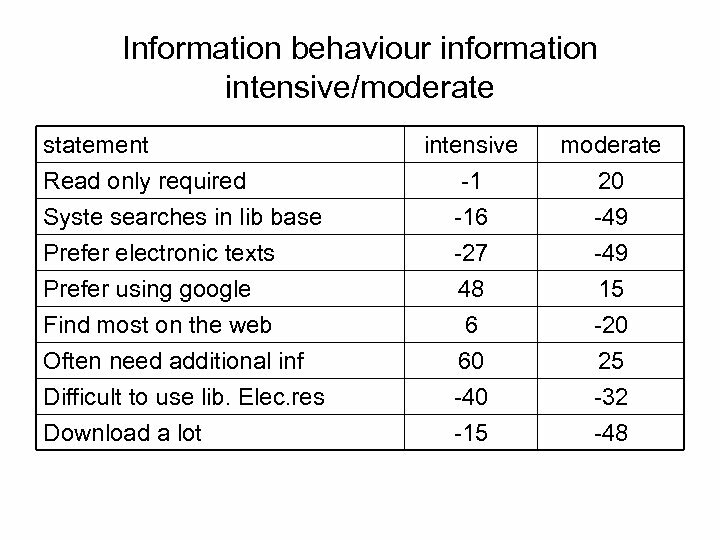 Results 3 • Both the information intensive and the information moderate students seems to have received library introductions. 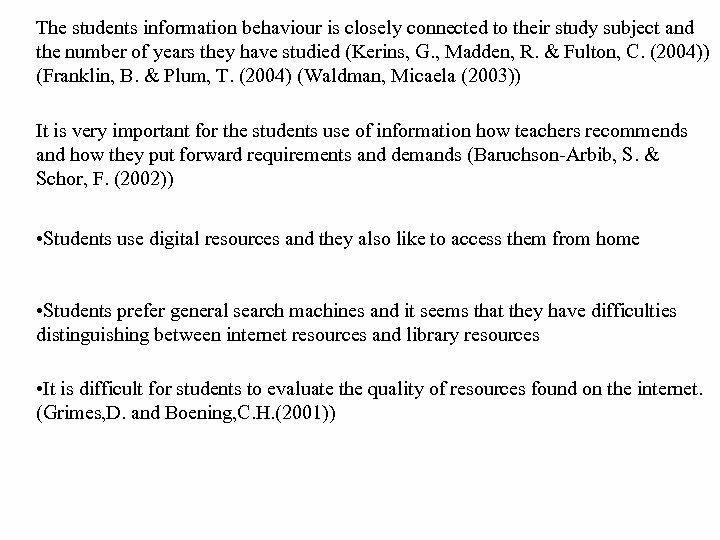 • Both the information intensive and the information moderate students seems to have received introduction to electronic library resources. 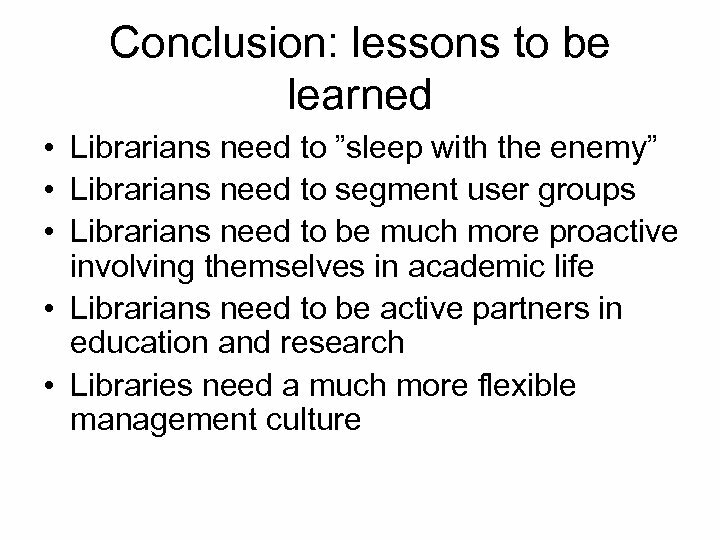 • Both segments only have vague ideas about whethere exists any cooperation between their teachers and the library. 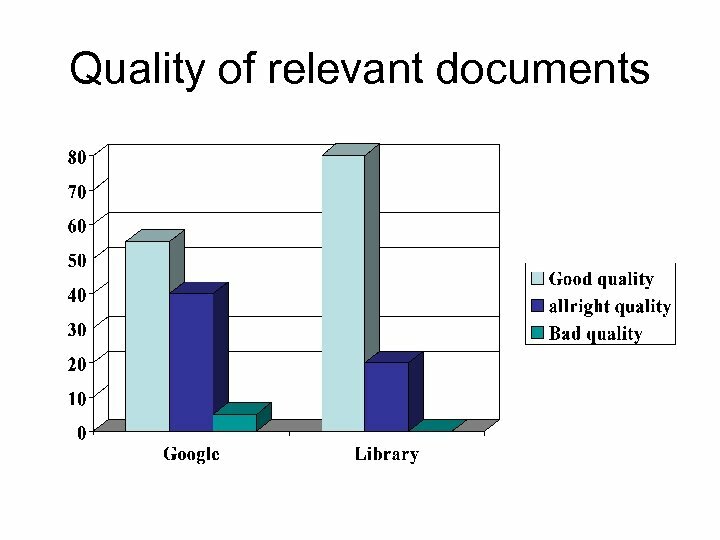 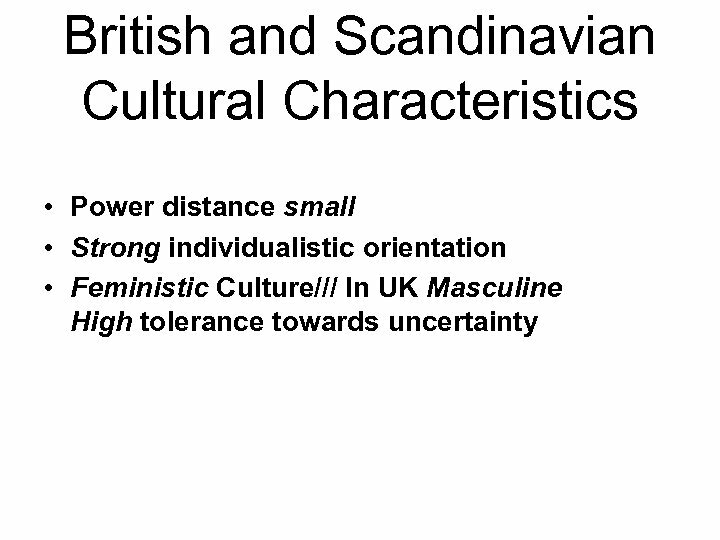 • A small but significant difference can be identified among the two segments concerning requirements for using additional literature during their study.